The RENUVO system in use on a blade. They call them skyworkers. Seen from a distance, they resemble ants as they manoeuvre around the blades of mighty wind turbines though, in fact, they are more comparable with spiders since they are supported and enabled to do their work by a web of ropes. They are a new breed of worker in composite materials, combining reinforced plastic maintenance capabilities with abseiling/climbing skills. They are inspecting, cleaning and repairing the sometimes enormous rotor blades whose good condition is vital to wind turbine efficiency. For these members of a new breed of industrial worker, a head for heights is a key qualification. Such technicians will become more commonplace as wind turbines continue to proliferate and amass operating hours. This is especially so given that wind farm operators, aware of the reputation of composites for durability, have tended to neglect inspection and preventive maintenance. Many are now learning that turbine blades cannot simply be ‘fit and forget’ items. They are subject to bird strikes; lightning strikes; leading edge erosion – especially towards the tips that can be moving through the air at around 200 mph, sometimes in sand and salt laden air – trailing edge damage; and material fatigue; plus surface erosion from rain, hail, ice and insects. Even without actual damage, surface roughness caused by minor pitting and particle accretion can spoil the aerodynamic efficiency of the blades, detracting from turbine productivity. With a growing number of blades now in service - many well outside their warranty periods - rotor blade maintenance is becoming a major issue. A limited cadre of technicians with the required skills already employed by the operations and maintenance (O&M) departments of turbine manufacturers and a few specialist repair companies are now being augmented through training schemes. Courses are provided by blade manufacturers, which are keen to preserve a good service reputation for their products by seeing that they are properly maintained. Denmark's LM Wind Power, for instance, offers a three-day course designed to impart basic composite repair skills. Other manufacturers, including Vestas and Enercon, provide similar training. Currently most repairs are of the ‘cut out and fill’ type or, in the case of laminate repairs, wet lay-up. However, TWS claims its technicians can also handle infusion and prepreg repairs, along with restitution of gel-coats and surface finishes. Vacuum bagging and heat curing will not phase them, and they can execute anything from small surface repairs to medium structural repairs, dealing with a wide range of materials including polyester, vinyl ester and epoxy resins, along with glass, carbon, aramid and biocomposite fibres. A technician's visit can encompass anything from a close visual inspection with report, through blade cleaning, to a modest structural repair – a damaged tip or edge for example. Because a skyworker has either to take everything required for a job with him (or her), or have it hoisted up or lowered down to the working position, repair procedures have to be carefully pre-planned and managed, with adequate back-up from other team members. Resins (for wet lay-up) will have to be mixed on the ground just prior to use and hauled up, with all necessary working implements, to the repairer. One of the most difficult aspects, says TWS' Kane, is arranging the services required for tool operation - and for curing the resin. Working on large turbine blades requires a powerful compressor on the ground so that, over a long pipe run, adequate pressure is available aloft to drive air-powered tools. Similarly, electric power for mat heaters is subject to losses in long power leads. The technicians themselves are normally suspended from the rotor hub, working on the subject blade – which is stopped in the down position. Anchor lines may be deployed to the tower or around the blade. A project overseer on the ground is responsible for such matters as resin preparation, control of cure parameters, and keeping records for quality control purposes. Communication between skyworker and other members of the team is by VHF radio. Enormous care is taken over safety. Only technicians trained to the standards of the International Rope Access Technicians Association (IRATA) - using approved synthetic ropes, climbing equipment and personal protection equipment - are acceptable to insurers. In the event of a technician suffering an injury or other emergency whilst aloft, the roping arrangement should allow for at least one other climber to abseil down and effect a rescue. A comprehensive safety check carried out before the start of a task includes such matters as verifying that wind speed is less than the limits mandated for such work - normally around 12 m/s - and that the rotor is braked and locked in static position. Overall, the safety record with rope access has been good and Alasdair Kane is a keen proponent of the method. TWS recently completed a task off Milford Haven, Wales, which involved a thorough visual inspection of all blades on a group of turbines, followed by in-situ repairs. Instances of damage were mainly on the leading and trailing edges, particularly on the outer third of the blade length. Procedures carried out included full laminate repairs by wet lay-up with heat blanket cure. Rope access proved more than adequate for the work and, although at 25 m the blades in question were relatively modest in size, though much larger blades – for instance those on Vestas V90 turbines – have been dealt with similarly. As it happens, that something may be at hand. A recent demonstration of a new blade repair system showed that curing does not need to rely on heat, rather the process used strong ultra-violet (UV) light to harden the UV-curable resin in minutes rather than hours. The demonstration used a process called the RENUVO system, applied to a sample blade section in a laboratory at the Isle of Wight premises of Gurit UK (formerly SP Systems). Available in ‘builder-size’ cartridges for use with a standard cartridge gun, this multi-purpose system (MPS) remains uncured for as long as it is kept out of the light, particularly UV-intense sunlight. Indeed, it has a shelf life, if stored in cool dark conditions, of several years. Once applied to the repair site however, it can be cured in minutes with a hand-portable lamp utilising UV light emitting diodes (LEDs). Two MPS grades are available: a summer grade for use in temperatures of 15°–30°C; and a winter grade for 5°–18°C. 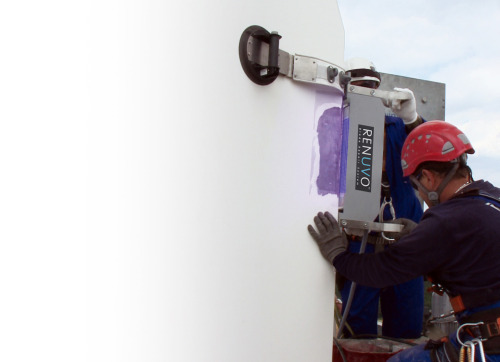 Where more substantial damage calls for laminating attention, the RENUVO solution involves a range of UV curing prepregs which combine another UV curing resin with composite fabric. The prepregs, like the resin, are available in summer and winter grades. Repair patches made up from stacked prepreg plies can be relatively thick, so a more powerful UV lamp is needed to effect a cure. This, however, is still based on robust and energy-efficient LEDs. Patches up to 5 mm thick can be cured in a single exposure of some three minutes, and thicker repairs can be made by building up and curing the repair laminate in multiples of 5 mm. Repairs generally start with a technician on the blade grinding or routing out the damage and preparing the resulting site to receive the repair. The edges round the excised area would normally be bevelled to receive a ‘scarfed’ repair. (A scarf joint is one where matching bevelled edges provide increased bonding area and mechanical strength). Repair patches are formed by stacking a succession of overlapping plies such that each has a greater perimeter than the one below it. In the demonstration, we first saw the slightly white, almost translucent MPS resin used for a spot repair to a small leading-edge impact pit of the sort which, if left untreated, might subsequently allow moisture to be absorbed into the laminate. It is important to prevent this since low winter temperatures exacerbated by wind chill can cause trapped moisture to freeze and expand, exerting a force that may cause delamination. As protection against any accidental skin or eye exposure to the powerful UV emitted by the lamp, we first donned long-sleeved white coats and UV-filter glasses. A technician explained that, although the lamp emits light at the safer end of the UV spectrum, protective precautions are still advisable given its considerable power. It was assumed that any damaged and flaking material around the site had already been removed and the site thoroughly dried, so the technician began by masking off the area around the repair to prevent resin from spreading onto undamaged surface. Next, MPS resin was dispensed from the 310 ml cartridge into the crater. The product is already pre-mixed so no dedicated mixing nozzles are required. The resin, which has a grease-like consistency, was consolidated into the crater by hand with a small plastic scraper. Then, the masking tape was removed and the hand-held UV lamp was applied to the site and switched on for the required length of time. For most spot repairs the lamp, a ‘Neolectron’ engineered by Johnson-Allen, is held some 40 mm away from the surface of the repair. This positioning is facilitated by a 40 mm ring spacer attached to the front of the lamp so that the operator can simply hold the lamp and spacer against the repair site and switch on. Power for the lamp is provided by a standard rechargeable battery pack. We were able to verify that, after an exposure of just 90 seconds on an approximately 5 mm deep fill, the repair was apparently fully cured, hard and integral with the surrounding material. On a real blade, the next step would have been to fair the surface by sanding the repair. The second part of the demonstration involved a structural repair, i.e. one requiring fibre reinforcement. The latter is provided by unidirectional and biaxial prepregs, used exclusively or in combination as necessary. These are laid up as a prepreg stack to form a composite repair patch. By combining RENUVO PP (prepreg) plies appropriately, a patch can be produced that replicates quite closely the mechanical properties embodied in the original undamaged laminate. The MPS resin used in combination with the prepreg acts as the interface to the substrate and can also provide a smooth, easily sandable top surface to the final repair. Patches must be applied to well prepared sites having clean, sound substrate that is free of moisture and contaminants. As part of the preparation, the technician at the blade would have used a grinder to chamfer the edges of the repair site, typically with a 1 mm over 15 mm chamfer for a 600 g/m2 biaxial ply. Meanwhile, on the ground, the necessary rolls of prepreg fabric – previously stored, with black UV blocking backing sheet, away from direct sunlight to maximise shelf life – would be taken from store and suitable amounts unrolled. At this notional point, the demonstration kicked in with oblongs of biaxial fabric being cut in accordance with the recorded dimensions of the repair site. So that the oblongs overlap correctly, a simple template can be used to achieve the required overlaps. Next, UV blocker backing sheet was removed and prepreg plies were stacked. In ‘real life’ this would be in the order and orientations specified in a repair schedule. Care would be taken at all times to work away from direct natural or UV light so as to avoid the risk of premature cure. In the lab, the technician placed the prepared stack in a portable heated vacuum table, developed by Gurit in conjunction with Aerovac, where a temperature of some 50°C applied for 15 minutes brought about pre-consolidation. Depending on patch size, the flat-bed pre-consolidator can process several patches together. The lower side of the consolidated prepreg patch was then coated with a thin layer of the resin to act as a wetting interface between the patch and the blade surface. After protecting the pre-consolidated patch from UV or sunlight with more UV blocker, the technician rolled up the patch slightly and showed how, in the field, it could be conveyed in an art tube to the repair site at the blade. Multiple patches can be carried in a shade (quiver) box. Next, the patch was applied to the ‘damaged’ area of the leading edge section, being worked up and down and side to side so as to help wet out the substrate with the RENUVO resin. The grease-like resin allows the patch to slide into position without disturbing fibre alignment so that, for repairs involving multiple patches, scarf joints between the patches can be aligned accurately. Using a roller and working outwards from the centre, the technician then expelled trapped air and excess paste from under the patch. Next he removed the protective UV backer and spread excess paste along the length of the patch to provide a surface for fairing. A skim of paste over the entire area fills any hollows and provides a sacrificial coating that can be abraded ready for a final protective finish. Next came the UV cure stage. For this, a rather more powerful lamp, still LED based, was used as a higher intensity UV source. The LED 400F lamp, developed in partnership with Sadechaf, a leader in UV light technology, is capable of irradiating the repair at some 600 mW/cm2 and can be pre-programmed for timing and intensity. Because the demonstration repair was considerably wider than the 250 mm by 60 mm footprint of the lamp, it was cured in several three-minute exposures, the lamp being stepped round the repair on a special mounting system comprising two large flexible belts strapped round the blade and having fixing lugs for the lamp. This system enabled the UV source to be indexed evenly around the repair to effect a cure in strips. A mask separator assured the 30 mm separation from the repair face that is optimum for the LED 400F. Because this powerful and robust industrial lamp is larger and heavier than the hand-held source used for non-structural repairs, procedures using it are best carried out from a platform as the logistics would be challenging for rope access teams. There has reportedly been much interest in RENUVO PP, not least because wind turbine interests see that it expands the window of opportunity for blade access. Another advantage is that prepreg patches avoid many of the pitfalls of wet lay-up. “Wet systems need to be accurately mixed and tend to generate high levels of waste. With prepregs it's hard to go wrong as the job is half done for you. RENUVO materials are easy to handle, requiring no mixing or awkward hand impregnation of heavy glass fabrics. Furthermore, there's little chance of wet resin somehow getting onto synthetic ropes, something that leads to ropes having to be discarded”. All the materials used in the product are now GL approved. Gurit is currently seeking approval for the system overall from leading blade producers and is in advanced talks with at least five of them. They will want to be satisfied that RENUVO repairs result in laminate properties more or less equal to those of the original composite, along with repair durability. John Darlington, a maintenance and repair specialist with the UK branch of BS Rotor Technic, notes from practical experience that the new system can drastically reduce the time it would normally take to carry out repairs. In contemplating a job in Scotland involving 26 turbines that have been turning for ten years without significant attention, he believes that his rope access teams can complete a restoration using RENUVO in half the time that would be expected using conventional wet lay-up. The work will involve removing the pitting that a decade of weather erosion has produced and restoring the surface to nearly new condition. Such restoration is important to reverse a performance degradation of up to 20%, he says, and more work of this sort becomes viable with an accelerated repair system. Darlington believes that, as well as operators developing their own repair procedures for out-of-warranty blades, blade manufacturers themselves will eventually specify the approach within their own standard repair manuals. George Marsh: Engineering roles in high-vacuum physics, electronics, fl ight testing and radar led George Marsh, via technology PR, to technology journalism. He is a regular contributor to Renewable Energy Focus. 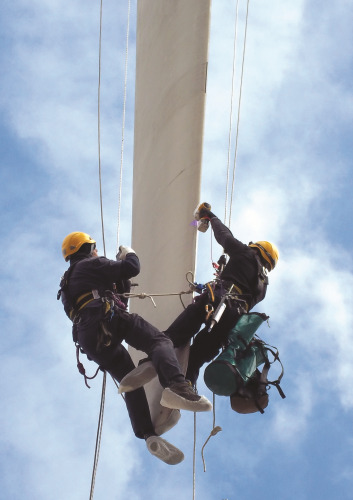 Renewable Energy Focus, July/August 2011.
the use of industrial rope access is now finally being seen as a huge benefit to the blade repair and inspection industry, saving time and resources by mobilizing highly skilled teams of climbers. good article. Gives insite on the difficulties and challenges faced by people working on the job at heights.